OMAN JOBS INTERVIEW IN CHENNAI: URGENTLY URGENTLY REQUIRES FOR A LEADING Interview at CHENNAI. ASPHALT / ABC COMPANY. 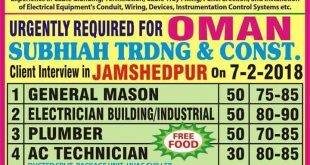 OMAN On MARCH PAVER OPERATOR WHEEL DRIVER PNEUMATIC TIRE ROLLER OPERATOR of Asphalt PAVER TECHNICIAN RAKE SCREW /GUAGE MAN SERVICE TECHNICIAN ASPHALT PLANT MECHANIC PLANT ELECTRICIAN ABC PLANT OPERATOR Need Only High Skilled with good Experience Required 100 Nos. (GCC Licensed candidate preferred other than KSAD SALARY:18000 to 42000 Only shortlisted Candidates can Attend the Interview. Interested Candidates can send Resume All Certificates Passport copies to [email protected] ITL TOURS Our Licence Validity No.23 & 24, Ground Floor, Deshbhandu Plaza, 47, Whites Road, Royapettah, Chennai -600 014. www.ghantootgroup.com. HO: 1st floor Heera Chambers, M.G. Road, Pazhavangadi, TVM. Mob: 9941004057, 9941004079, 044-42023438, 421 17895.